moved from Sat 18May2013 B.E.F. presenting "Music Of Quality And Distinction III" ==> "DARK"
See the BEF homepage for details. moved from Fri 17May2013 B.E.F. presenting "Music Of Quality And Distinction III" ==> "DARK"
Heaven 17 is currently listed to be on stage on Saturday August 17th, but check before you buy! 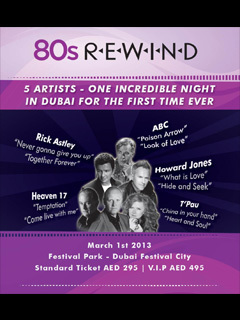 See the rewind website for details. See Silicon Dreams website for more details. See Electricity-Club for more details. Go and see the CHVRCHES and other bands. See THE SPACE for details. 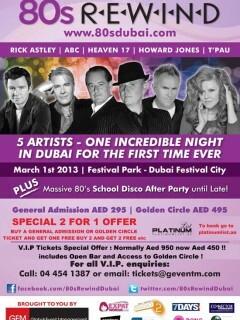 THE BIGGEST MUSIC STARS OF THE 80'S ARE COMING TO DUBAI WITH A FANTASTIC LINEUP THAT INCLUDES ; RICK ASTLEY, A.B.C, HEAVEN 17, HOWARD JONES AND T'PAU.